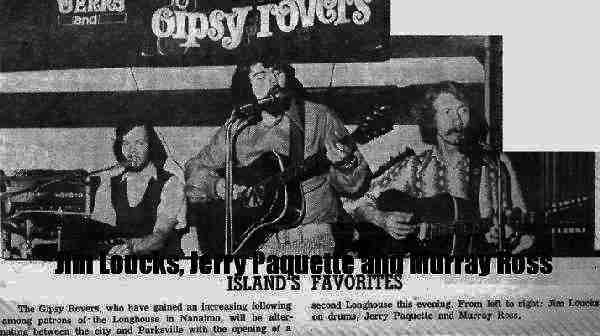 The Gipsy Rovers, were very popular in Nanaimo. Along with the group 'Shawanagan' they helped get the first night club in Nanaimo established in the early '70's. The Longhouse was a restaurant that expanded into a regular hot spot during the night in Nanaimo. Nanaimo is home to the bathtub races and, it's been said, had the record for the most beer drinking establishments per capita in the '70's than any other city in Canada. Much-loved musical talent, Jerry Paquette, died on Friday, 21 May 2010, just a few weeks short of his 61st birthday. Paquette died at Nanaimo Regional General Hospital of pancreatic cancer. "He was a very talented guy," said his brother Roger. "He was loved and known by (many) in Nanaimo." A self-taught musician, he started playing trumpet before age 10.